Paper, Lace and Buttons. : Meowy christmas. I love this image of Tilda with her kitty singing, simply adorable and chose this to make a start on my Christmas cards ahead of any rush. Go Kreate dies, Doohickey bauble and snowflake die. large snowflake I think is Marianne. 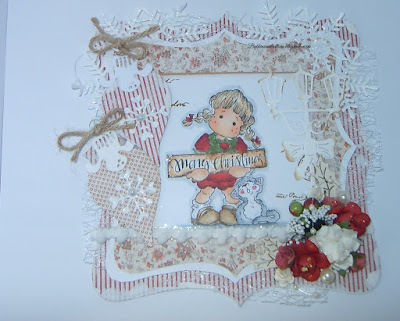 Joanna Sheen signature die festive streetlight. chipboard holy leaves, flowers, stamen, ribbon, mesh and cheesecloth. flowers, apples stamens from stash. Chipboard holy leaves and bubble ball ribbon. Stickles, glitter and structure paste. Entering into the craftygals challenge # 133 Anything Goes.